Animal planet reached out to MARL in February looking for an established shelter that was doing great work but whose facility could use some improvements. Operating in a 63-year-old building, we were eager to hear more about this opportunity. After a long interview process, MARL was selected in May and jumped into action quickly. Animal Planet heard us loud and clear when we asked for new kennels. They installed state-of-the-art kennels in place of our old chain link system. 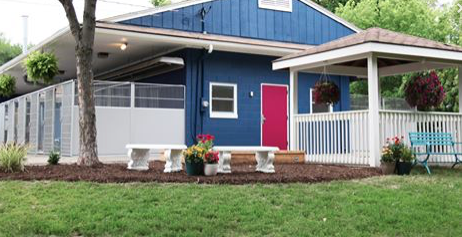 They gave the outside of the building and our lobby a cosmetic face lift, renovated the cage-free cat room, beautified the backyard and added a “real-life room”. Of course, we weren’t allowed to see any of it until the big reveal so it was a complete surprise to most of the staff and volunteers. In the two-part special, a deserving shelter receives a complete transformation, which viewers will be able to see from inception to completion. Hosted by animal expert and trainer Dave Salmoni and featuring the renovation experts from Project Pawsitive, the Pet Nation Renovation team will transform this deserving animal shelter so that it can better serve all of the dogs and cats that need their care. Throughout the journey, Dave will talk to the inspiring staff, showcase the personalities of the pets, and work day and night alongside the contractors until the renovation is complete. The project was made possible with the help of Ace Hardware, Delta Faucet, Quicken Loans, Project Pawsitive, K. Mason Building & Remodeling and some really incredible volunteers!